I've had to source a brake master cylinder and proportioning valve from the wreckers for my car. The parts are in reasonable condition with a bit of rust on the outside housing, the guy at the wreckers said the car had been sitting for at least a few years. I looked up some parts catalogs and it appears they don't make rebuild kits for it anymore because 1981 was a while ago (its not a corolla). Basically I want to throw these parts on the car but I don't want them seizing up all my brakes. I read you can soak the master cylinder in vinegar, and put it in the dishwasher apparently, don't think the misses is gonna let me do that. If I have some rust inside the piston area is this a reasonable idea to soak it in vinegar for a bit and throw it on the car, or is there any other way I can cheaply and easily do a minor reco. I wouldn't trust myself completely pulling one apart and putting it back together correctly haha. Dunno your location, but plenty of proper brake shops will rebuild any mastercylinder with custom made parts. 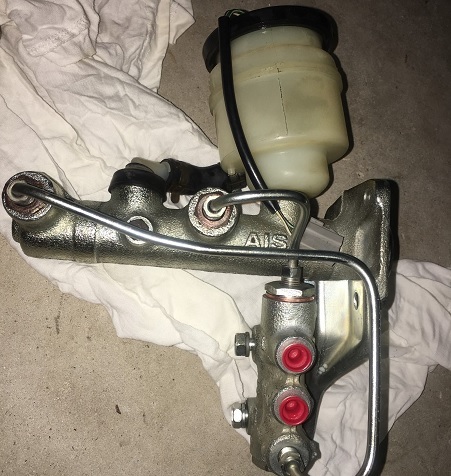 Theres a shop i use in wynnum brisbane Australia called "master cylinder exchange". They machine the inside of the cylinder, insert a stainless steel sleeve, machine up a new pison or reco the old one and then put in all new seals. I do not belive they use seal kits, rather just machine the items to suit off the shelf seals. Ive had a number of calipers done there anda couple of mastercylinders. You do pay for it though, around $250 for a mastercylinder reco last time. But its better than new. Any kind of rust in the piston/sleave is a big red flag that it should not be used without some attention. and with rust you really do need to machine the surface flat. Cleaning witih vinegar or the likes really isnt good enough. I was really hoping to avoid spending money, but thanks for recommending master cylinder exchange at wynnum. I got the master cylinder and proportioning valve rebuilt there. It was in much worse condition than I first thought, the piston was seized. He took a look at the proportioning valve as well, and machined a new part for it, it was all very reasonably priced as well. I guess it does pay to spend the money to get it repaired right otherwise it probably would of just spread rust to the rest of the system and seize up brake pistons as well. So those guys are still there hey. I havent been there for years. Last time I got them to do some odd ball machining for some coilovers....in 2009! Its always worth having top notch brakes if you value your life, its not all about saving money. Well done!